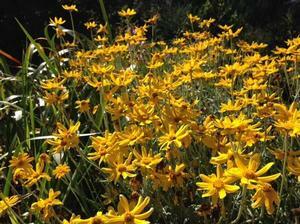 Siskiyou woolly sunflower forms a low mat of gray-green woolly foliage up to 1' tall and 2-3' wide. Yellow daisy-like flowers bloom spring through fall. Woolly sunflower (Eriophyllum lanatum) is an extremely variable species. It's native range covers a wide area from the immediate coast to the high mountains of California and into Oregon. The cultivar 'Siskiyou' was introduced by Siskiyou Rare Plant Nursery. 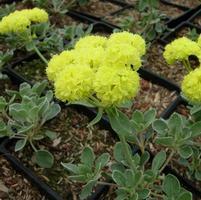 Siskiyou woolly sunflower has gray-green woolly foliage and forms low mats up to 1' tall and 2-3' wide. Sunny 2" wide faisy-like flowers bloom over a long period from spring through fall. This tough versatile perennial thrives in full sun or light shade. It prefers soils that drain reasonably freely. Once established, it'll survive on rainfall alone in coastal areas. The flowers are great sources of pollen and nectar for butterflies, bees and other insects. Very little maintenance is needed. A light annual pruning after blooming's finished will help to keep plants bushy.